An ergonomic keyboard is designed to reduce muscle strain and other uncomfortable issues or injuries that arise when typing. Furthermore, an ergonomic keyboard shields you against carpal tunnel syndrome, and it eliminates bad posture that results from repetitive motion when typing. A good ergonomic keyboard lets you type fast and gives you the freedom to control your computer’s media and volume. An good ergonomic keyboard lasts long, has an adjustable height and tilt, a wrist rest, easy-to-press keys, and extra function keys to help you control music player or your computer’s volume. Are you planning to secure a good ergonomic keyboard for your computer? If yes, this article is the perfect buying guide. We have listed and thoroughly scrutinized the top ten keyboards in the market that you should consider buying. Evoluent’s compact keyboard is a wireless ergonomic keyboard that lets you move it freely around your desk. The keyboard measures 12.5 inches wide, 6.5 inches long, and it stands at 0.5 inches high. It will work well with any laptop or desktop that is running on operating Windows XP, Linux, or UNIX. The ergonomic keyboard’s lightweight and small size enhances its portability. You can easily clean the keyboard by compressed air after it accumulates dust. It is suitable for a small or crowded desk. It uses two AAAA batteries. Subsequently, you need to change the batteries after they drain, or else your keyboard will not work. 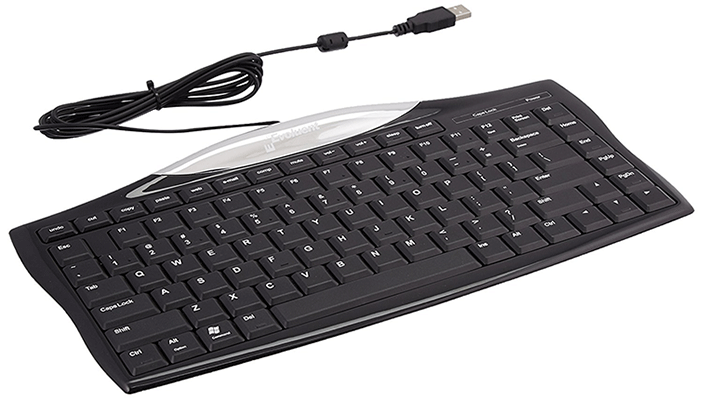 The Evoluent wired compact keyboard measures 12.5 inches long, 6.5 inches wide, and 0.5 inches high. This compact size lets you use the keyboard in a crowded space with small space. Besides the small size, this ergonomic keyboard also has 12 hot keys that give you the freedom to mute your computer, adjust the volume, and even turn off your computer. You can use the keyboard on any computer whose operating system is Linux, Windows XP, or Mac OS X. Its small size and lightweight let you travel with your keyboard. At first, you might experience trouble using the keyboard since some keys are re-arranged. This freestyle ergonomic keyboard features an integrated palm support that supports your wrist when typing. 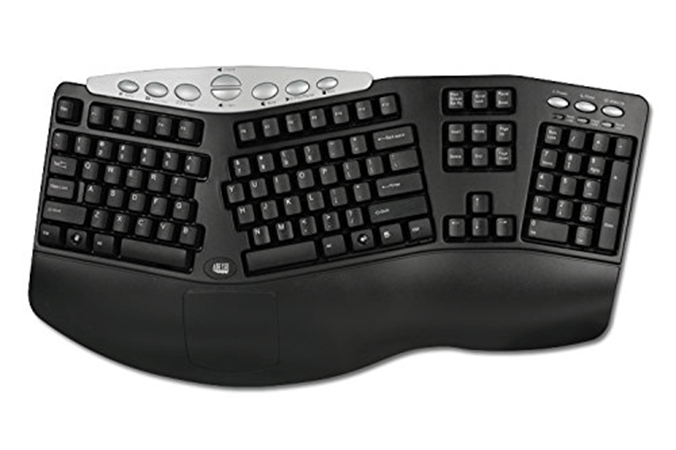 The Kinesis Freestyle ergonomic keyboard measures 15.4 inches long, 7.1 inches wide, and 0.9 inches tall. Other notable features on this keyboard are the left and right V-lifters that let you adjust the slope of your keyboard. The ergonomic keyboard’s stable typing platform lets you type easily and quickly. You can separate the keyboard into two parts for better ergonomics. The ergonomic keyboard’s large size makes it less portable. 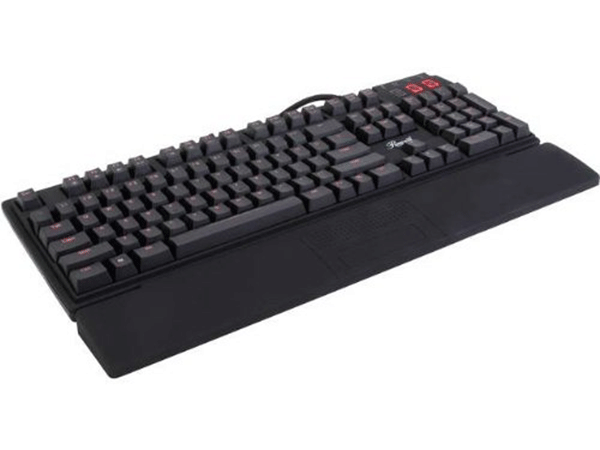 Image Programmable gaming keyboard features the standard key layout, micro keys, and a programmable driver. 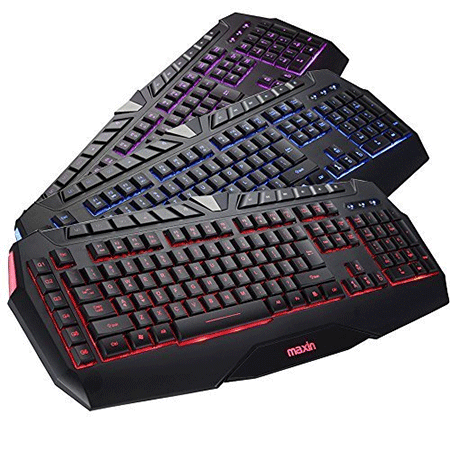 The three elements play a synergistic role in improving your gaming and typing experience. The programmable keyboard has a backlight that lets you use the keyboard at night. Image Programmable gaming keyboard has a 64kb memory space. The keyboard has multimedia control keys that help you adjust your computer’s volume. Image programmable keyboard lacks a non-slip base to secure it firmly on your desk. The mechanical keyboard from Rosewill is a custom programmable keyboard with a detachable wrist rest that supports your wrist when using the keyboard. Other notable features on this ergonomic keyboard include a built-in headphone and headphone jacks, a built-in USB hub, a braided fiber cable, and a red backlight. The red backlight on the keyboard lets you use the keyboard at night. You can use the built-in microphone jack to listen to your music through your headsets. The connecting cable features a quality braided fiber cable that lasts long. Its high-speed USB cable lets you transfer files to your computer. The LED lights cannot be replaced once they fail. 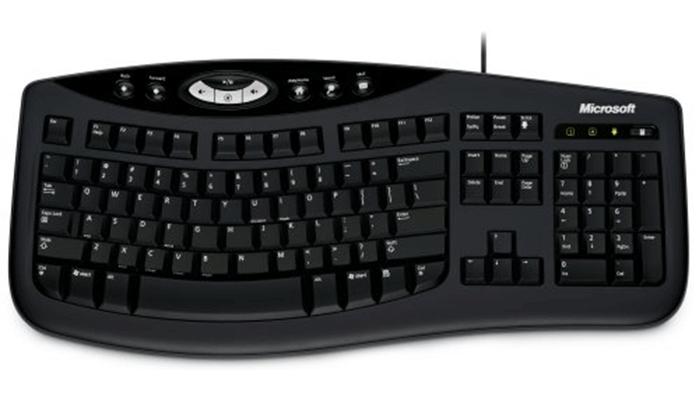 Adesso Media contoured ergonomic keyboard measures 19.25 inches long, 10.75 inches long, and 2 inches tall. It features 105 keys to let you type and operate your computer quickly and easily. Furthermore, the keys feature a split key design that lets you type easily with minimal typing errors associated with a key arrangement. The ergonomic keyboard is compatible with multiple operating systems. Its multimedia keys help you control your computer’s media and adjust the volume using your keyboard. Unlike other ergonomic keyboards whose keys are configured differently, this type maintains the original order. It lacks adjustable feet to help you adjust the keyboard to a proper recline. 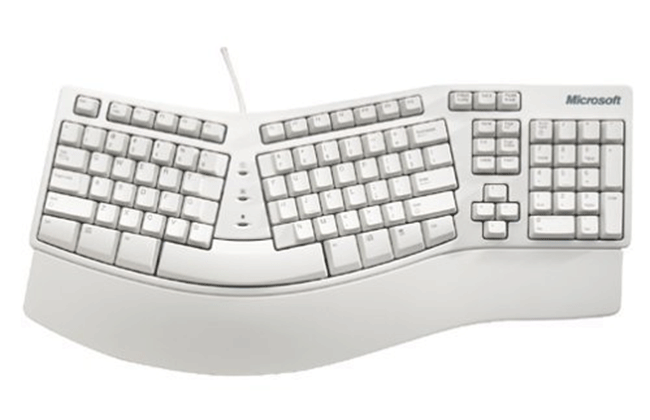 Microsoft’s comfort curve keyboard features 104 keys arranged in the original QWERTY style to let you type quickly. The keyboard features an intelligent ergonomic design that lets your hands rest comfortably on the keyboard while typing. Other attractive features on this keyboard include the slim design that occupies less space and the ultra thin profile keys that are easy to press. The keyboard is easy to use since it needs no software to enhance its compatibility with your computer. Microsoft Comfort Curve Keyboard is spill resistant. It is compatible with all computers running on Mac OSX, Windows XP, and Vista. Some keys stop working after a period of use. The Natural keyboard elite come in black and white colors. Microsoft’s original keyboard features an intelligent design that lets you align your palm and wrist naturally when typing. Furthermore, the keyboard has multimedia keys to help you control your playlist and F-keys that let you command your computer. The keyboard connects quickly to your computer. It comes with a three-year manufacturer warranty. The keyboard’s ergonomic design shields you from wrist pain and bad posture. Some keys may stop working after some period. 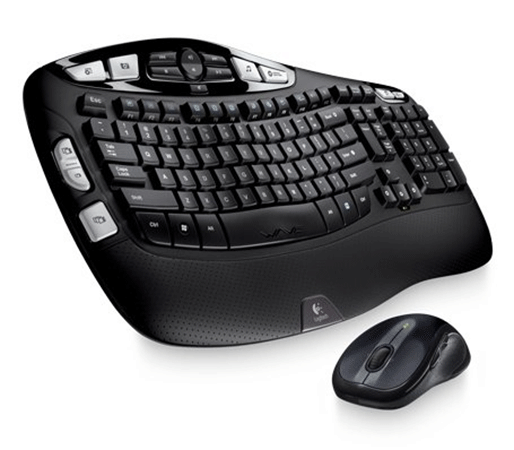 This wireless keyboard and mouse combo features a mouse with rubber grips and an ergonomic keyboard with a cushioned palm rest. The mouse with rubber grips helps you control the cursor with ease while the keyboard’s cushioned palm rest shields you from discomfort and wrist pain. You can use the keyboard and mouse 10 meters away from your computer. The keyboard’s batteries last up to three years. Its ergonomic design protects you from bad posture and wrist pain. You need to replace the batteries after they drain. Microsoft’s ergonomic keyboard 4000 features an ergonomic design that promotes the natural alignment of your wrist and forearm. To achieve an enhanced support, the keyboard features a comfortable palm rest that supports your wrist. Other notable features on this keyboard include a curvy bed, convenient hot keys, a zoom slider, and an ergonomic arc. The keyboard’s handy hot keys help you operate your computer using your keyboard. Microsoft 4000 keyboard improves your performance. It is compatible with computers running on Windows 7, Windows XP, and Windows 8. The keys are a little bit hard to press. You spend most of your time on the keyboard when operating your computer. Poorly designed keyboards can promote bad posture and wrist pain, and they can reduce your performance. Investing in a good ergonomic keyboard is a better way to improve your experience when using your computer.